Do you want to read the lawsuit for yourself? Well, we uploaded the document for you to read. Enjoy. 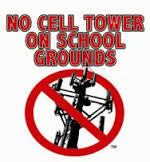 No Cell Towers On School Grounds Campaign – We Won! Statement from Get the Cell Out – Atl: Congratulations to everyone involved in every community who helped bring this subject to the forefront of their conversations and who held their elected officials accountable for their actions. And thank you to every person involved in this fight and similar battles taking place across the country. Your willingness to put yourself on the line in order to learn the truth and face skeptics should be an inspiration to others. We would never been able to stand up to the “system” here if there were not success stories of others who had faced the same Goliath, and won their battle before ours. We appreciate Commissioner Rader and the entire DeKalb County Board of Commissioners for stepping up and taking on this fight against T Mobile while upholding the zoning code in our communities. If you have not educated yourself about the many adverse effects that have been documented about cell phone towers, please look over the many sources available on our website or email us with questions. A good source of information can also be found at the Center for Safer Wireless – http://thecenterforsaferwireless.us. We also encourage everyone to thoroughly read the new zoning ordinance as suggested by Commissioner Rader and voice any feedback to the county commissioners and CEO’s office as soon as possible. 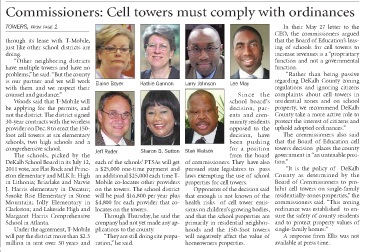 In 2011, T-Mobile and the DeKalb Board of Education proposed to build cell towers on 11 school properties located in residential areas. 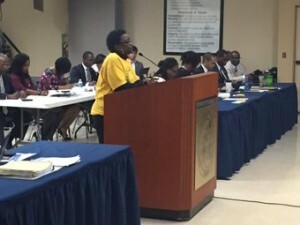 Many citizens and parents organizations were concerned and asked DeKalb County to act. At the urging of Commissioner Kathie Gannon, the DeKalb Board of Commissioners wrote then CEO Ellis and asked that the administration refuse to issue building permits because the tower locations, while on school properties, are zoned residential, which does not permit cell phone towers. The cell tower company and the DeKalb School Board challenged the right of County government to enforce its zoning code on school properties. Recently Federal District Judge Thrash ruled that the County acted properly in refusing to issue the building permits. 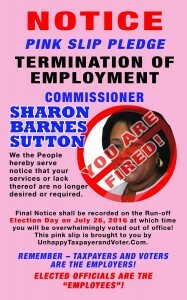 The Commissioner can be reached: http://www.kathiegannon.com or email kgannon@dekalbcountyga.gov. One of the most pervasive signs of our mobile communications society is the proliferation of cell phone towers across the landscape. In DeKalb, the mobile communications revolution occurred after the widespread development of the landscape, so the infill installation of these structures has been perceived as intrusive in many residential neighborhoods. One recent decision and one pending regulation are relevant and noteworthy. The recent noteworthy decision is the dismissal of a suit against DeKalb County by T-Mobile, a cellular provider. 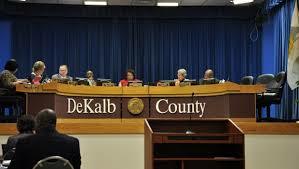 T-Mobile had sued DeKalb seeking a building permit for structures on two DeKalb County School System (DCSS) properties in District 2: Lakeside High School and Margaret Harris Comprehensive School. 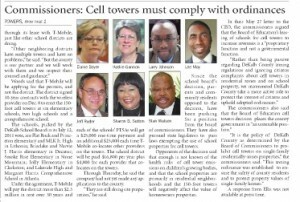 T Mobile had entered into a contract with DCSS seeking to invoke DCSS’s exemption from zoning regulation to erect the towers in residential districts where they are otherwise prohibited. 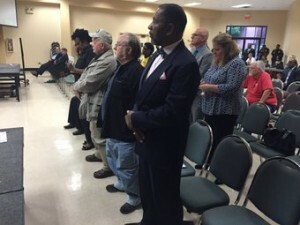 Encouraged by the DeKalb Board of Commissioners, the DeKalb County Administration declined to recognize the requested permits as exempt from zoning since the cell towers were not educational facilities. T-Mobile sued, but canceled their contract with DCSS after the Federal Courts ruled in favor of DeKalb. T-Mobile also paid DeKalb County court costs incurred in our defense. The decision is important because it helps limit exemptions to zoning laws intended to protect neighborhoods from incompatible development. Governments (Federal, State, Local and Public Schools) retain this important prerogative, but it should only be exercised to directly advance their public mission, not simply to generate revenue. The pending decision on the regulation of cell towers is in our new zoning ordinance, which will soon be considered by the Board of Commissioners. After considerable public input and a thorough investigation of relevant federal legislation, the current proposal would allow cellular antennas within or attached to nonresidential structures legally permitted in single-family neighborhoods. These would include houses of worship or other institutions that are legally permitted to be of sufficient height to make a cellular antenna attractive to a carrier. The new proposal would not allow the cell towers that were the object of the T-Mobile controversy. 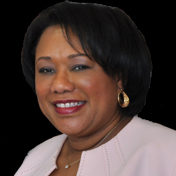 The Commissioner can be reached at: http://www.commissionerrader.com or email, jrader@dekalbcountyga.gov. Mark Niesse and Johnny Edwards wrote an article titled, “Audit: Spending reports sloppy” on October 24, 2014 in the AJC newspaper. The front page article was an investigative piece, highlighting the results of a ten year audit of the Board of Commissioners, their office staff and the clerk’s office purchase card usage. DeKalb County has been lax in its oversight of spending by elected commissioners, and some officials frequently paid for items on their government debit cards without submitting required receipts, according to an audit released Thursday. NOTE: Stay tuned for our take on this so-called audit. We have not done a complete review as of this date. However, a preliminary perusal of this report leave us with a lot of questions to be asked and answered. Office of the State and Federal Inspector Generals, Federal Bureau of Investigation, Sally Quillian Yates, DeKalb Board of Commissioners, Unhappy Taxpayer & Voter, CTEA, Restore DeKalb and all Appropriate Parties. 3. Parrott’s Open Records Request to the finance department for copies of the Bank of America Bank Statements and documents quoted concerning Commissioner Kathie Gannon’s payments to nonprofits for “kickbacks”. 4. Parrott’s Open Records Request to Purchasing and Contracting for financial information regarding Commissioner Gannon’s Ethics Complaint. It is important to increase transparency, ethics, and accountability in DeKalb County Government. It is paramount that we increase “Public Trust” in DeKalb County. We must hold our elected officials and their staff accountable. •	Did Monica Parrott receive any assistance in compiling the ethics complaint against Commissioner Kathie Gannon from elected officials and/or government officials/staff? •	Did Monica Parrott obtain the information provided in the ethics complaint through the help of elected officials and/or government officials/staff to intimidate, humiliate, and retaliate, etc. against private citizens? Monica Parrott’s ethics complaint against Commissioner Kathie Gannon contain false statements that are libelous and defamatory. We request the opportunity to subpoena Parrott to give a sworn deposition concerning the accusations stated as fact in her ethics complaint. We are particularly interested in the involvement of a third party or parties in these malicious statements. •	Commissioner Kathie Gannon has not paid Viola Davis and/or Unhappy Taxpayer and Voter “one penny” in money or any other in-kind financial support…period. •	Viola Davis and/or Unhappy Taxpayer and Voter has never received illegal financial support of any kind to include “kickbacks” from Commissioner Gannon or any other party. •	Viola Davis, co-founder of Unhappy Taxpayer and Voter, is not presently a member of PRISM due to the lack of payment of membership dues for over 1+ years. However, Davis thanks Monica Parrott for reminding her to renew her membership. •	Viola Davis is not part of a nonprofit “whose 501 (c) (3) status has been revoked by the IRS for non-compliance with its reporting requirement”. 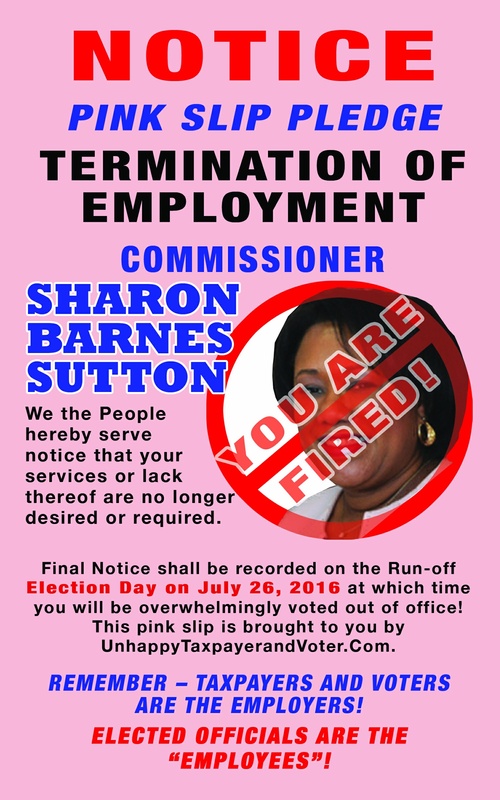 •	Viola Davis and the Unhappy Taxpayer and Voter ministry are not political operatives of Commissioner Kathie Gannon or any other elected official. •	Viola Davis is a critical care registered nurse (License number – RN101605 issued 9/18/1991) with over 20+ years’ experience in MICU, SICU, and CCU. As a Veteran with an honorable discharge from the military, I, Viola Davis, am a commissioned officer trained in combat nursing. The statement, “questionable income” is libelous and defamatory especially since Monica Parrott continuously references illegal activity throughout the ethics complaint. We also recently attended a meeting with the offices of the federal and state Inspector Generals. We requested information/documents on protection for witnesses and government employees with knowledge of illegal activity, wrongdoing, waste, mismanagement, abuse, etc. We have an obligation to educate the public and government employees who fear acts of intimidation and retaliation. We’re afraid this ethics complaint filed by Monica Parrott is an example of retaliation for attempting to hold our elected officials and government agencies accountable. The libelous and defamatory statements within the ethics complaint are acts of retaliation. We request a full investigation into the method that Monica Parrott obtained her information if no Open Records Request was ever filed. Once again, we view such acts as retaliation. If this request is denied in whole or in part, we ask that you cite in writing the specific statutory exemption upon which you have relied, as required by law, we also ask that you release all separate portions of otherwise exempt material. Please waive any costs associated with this request, or first inform us about such costs as required by Georgia Law. As you know, the Law requires a response by you within three business days of your receipt of this Open Records Request and provides sanctions for non-compliance. I look forward to hearing from you. I can be reached at 770-256-0034 or via email at UnhappyTaxpayers@gmail.com.